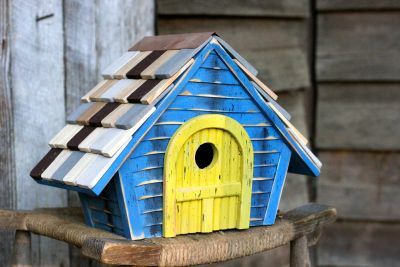 Bright colors and a multi colored roof gives this bird home curb appeal! Made and painted by hand makes each one unique. 1 1/2" hole with clean out and drainage built in. Evoking the waving grasslands of the Great Midwest, the Prairie home features sold cypress construction with a whimsical multicolored shingle patterned roof. The effect is complete with a complementary colored roundtop "door" highlighting the 1-1/2" entrance.